Something Good . . . I was a child, sitting in the backseat as we drove home from a destination I no longer remember. It was cold and snowing, the kind of heavy, blowing snowstorm that stings your face and numbs your fingers. It was a typical winter’s night in Appleton, Wisconsin. As we turned right onto Schaefer Street, the heat poured from the car’s vents, leaving us without a care about the temperature outside. Like the stars in warp-speed moments in science fiction films, the snow flew toward our car as we ventured onward. Through the snow, I saw two figures walking down the road—a mother and a child, groceries in hand, trudging through the snow on that blistery night. I felt the car brake and the wheels begin to turn as my father changed the direction of our trip. I don’t remember if he spoke any words to us—I’m sure he did—but a simple truth was conveyed to my young mind. He could not allow a mother and child to struggle in the bitter cold when he could do something to help them. I remember we pulled up next to them and they got in. I don’t remember what was said. I was so young. I remember we dropped them off at their home. I still remember. The brief, fleeting memories of that night are buried in my brain and return every so often to remind me what kind of man I want to be. To all of the men who have fathered, mentored, and loved the generations behind them by following in the footsteps of Jesus, thank you for being men worth emulating. Happy Father’s Day. Today is International Women’s Day. Lately, it seems like every day is a national day for something or other—cheeseburgers, friendship, clowns—but this day warrants much attention. This is not a day to shrug off as frivolous. When I think back over my life, I see how I was molded and shaped by women. Mothers, sisters, relatives, and friends, created in the image of God, make an unfathomable impact on our lives. I cannot imagine my life without the women who have shared it with me. I cannot imagine a world without their contributions. As we look to Jesus and the Gospels, we see an empowering, affirming view of the value of women. For His time and place, the fact that Jesus kept company with women was revolutionary. He had friends who were women. Women helped to finance and spread His message throughout the world, and they helped to build the church by their service and hard work. For Jesus, there was never a question about the value of women in His kingdom. Today and every day, thank God for the women in your life—the ones who have raised, molded, taught, and shaped you for all of your years on earth. Call them, text them, and show them how much they mean to you. In this, may we follow in the footsteps of Jesus, our Savior, who welcomed women as His disciples and friends. As we have been meeting various African-Americans who made or are making a difference in the world, there seems to be a common thread in each story. Many were heading one direction—until God interrupted. God changed the course of their lives, and we are better for it. John Perkins’ parents worked as sharecroppers, a common job for black people in Mississippi in the 1930s. His life began tumultuously—his mother died when he was seven months old, and his father left shortly afterward, leaving John and his siblings to be raised by their grandmother. As time went on, John attended church mostly because that was the only place where black people could get together to socialize. After John’s brother, Clyde, was shot and killed by a white deputy outside a movie theater, John moved to California at age seventeen. The Golden State did not have the same open racism so prevalent in Mississippi and it provided opportunities for John to succeed. Life was going well for him. John was able to marry his sweetheart, Vera Mae Buckley, who was also from Mississippi. John seemed to have a course for his life, working as a janitor and then as a welder after serving in the Army. Then God interrupted him. His young son, Spencer, wanted his daddy to come to church with him. While in church, John came to faith in Christ. And as he began to read his Bible, he felt called to begin preaching the gospel. Once again, God interrupted. John felt God was telling him that he needed to return to Mississippi, the same place he fled from. John and Vera Mae held Bible classes, Sunday school classes, Youth for Christ meetings for young people, and evangelistic tent meetings for the whole community. They advocated for social justice and helped to start churches, a child care center, economic cooperatives, credit unions, and leadership training programs. One day, John learned that one of the white volunteers he worked with had been beaten badly by the police for participating in a peaceful protest. When John and other men arrived at the jail to post bond, they were beaten as well. As much as John wanted to, he could not hate the officers who had done this. He didn’t want hatred to make him into the kind of person these officers were. John Perkins did not become a man of hate, but rather a man of reconciliation. He worked in California to create the Christian Community Development Association with the stated goal of bringing races together for the sake of the Gospel. Let us thank God for John Perkins, who allowed for God’s interruptions in his life. May we be the kind of people who return love for hate and press on to share the Good News. The name Roxane Battle may not be familiar to you. As I’ve been writing these posts, my desire is to discuss people you know and also introduce you to new friends. Every person has a story, and God can use them to provide insight and help us grow. Roxane Battle had much success professionally as a news reporter and TV anchor. She was sent on many assignments and interacted with notable people such as Jay Leno, Mariah Carey, and the musician Prince. So often in life, we want to “matter,” to have a high-profile career or recognition. Our dreams do not typically have us sitting on the sidelines, but front and center. We want to make a difference. If this definition is how we see our lives and how we wish we could write our stories, Roxane was living the American dream. Idealized dreams—where we are the sole author and only wonderful things happen to us—are rarely real. After obtaining her dream job in Minneapolis, pieces of Roxane’s life began to crumble. Her marriage fell apart, leaving her a single mom to her eleven-month-old son, Jarod. For her, it was an accomplishment simply to keep it together on camera every day. Even with a dream career and a television presence that looked polished and wonderful, life became difficult for Roxane. She was struggling financially and a strong sense of loneliness overwhelmed her. Things became so difficult that it was hard to keep food on the table. This was not the story she had written in her mind. This was not where she wanted to be. After coming through difficult circumstances, Roxane’s goal is to share that journey with others. By sharing our stories, people with similar struggles realize that they are not alone. Roxane shares her story in her book, Pockets of Joy. 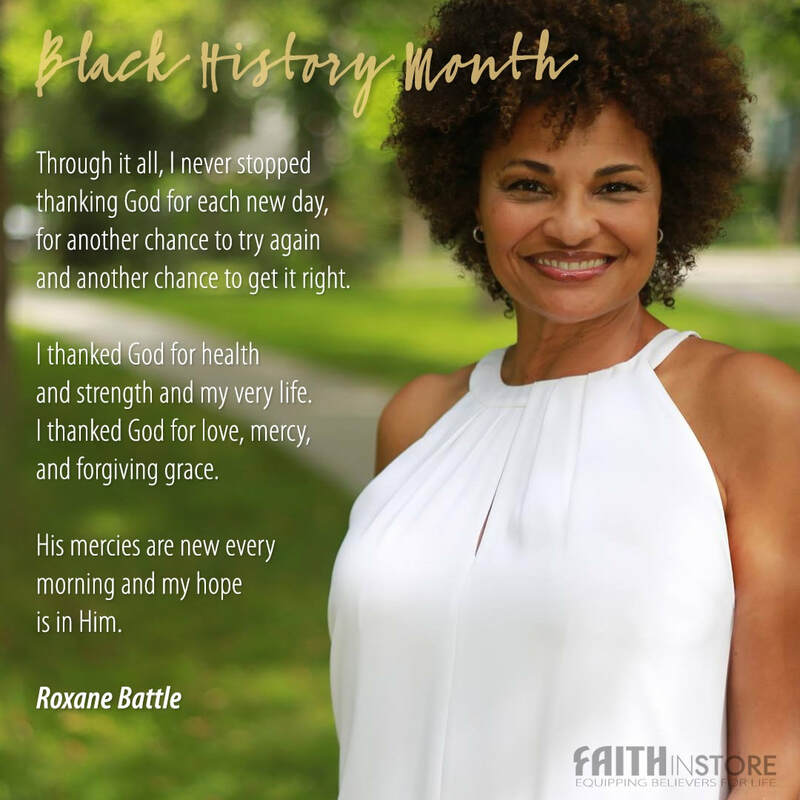 May Roxane inspire us to share the stories of our lives—not to simply gloss over the difficult chapters, but to allow people to see our brokenness so they, too, can be healed. Sam and Patsy McLeod had seventeen children but their fifteenth, Mary Jane, had one important distinction: she was the first one born free. Although Mary Jane McLeod Bethune was born after President Lincoln’s Emancipation Proclamation of 1863, segregation and other obstacles kept “free” from meaning equal. While God creates every person in His image, many times, mankind has rejected that ideal. In order to look at ourselves as better, stronger, and worthy, we trample what God has created and try to reframe the value that has already been given. Mary determined that the difference between white people and black people was education. She noticed that white people could read, giving them many advantages in life. A school for black children opened in her hometown, Mayesville, South Carolina, and Mary became a promising student. In fact, a few years into her schooling, her teacher nominated her for a scholarship to Scotia Seminary (now Barber-Scotia College) in North Carolina. Once enrolled, Mary was able to study literature, Greek, Latin, the Bible, and American democracy. She excelled. As she grew in knowledge, she began to have a strong desire to teach and hoped to become a missionary in Africa. In order to pursue this dream, Mary attended the school that is now known as Moody Bible Institute in Chicago. With her dream in her mind, Mary continued to work hard toward her goal. However, at the end of her schooling and after applying with the Presbyterian Mission Board, she received news that there were no openings for black missionaries in Africa. Mary felt heartbroken, but her will was undeterred. She decided that if she could not go to Africa, then God must want her to teach people in the south. She married Albertus Bethune in 1898, and they had a son, Albert. They moved to Florida and Mary started a school in 1909 with five girls and her son as students. Her school kept growing and in 1931, it merged with Cookman Institute, forming the Bethune-Cookman College, a coeducational junior college. Mary was its first president. During her years of teaching, her dream was to teach the children’s heads, hands, and hearts. She believed that classical, practical, and spiritual education was important in the fight for equality. Let us have the strength to press forward in this fight. 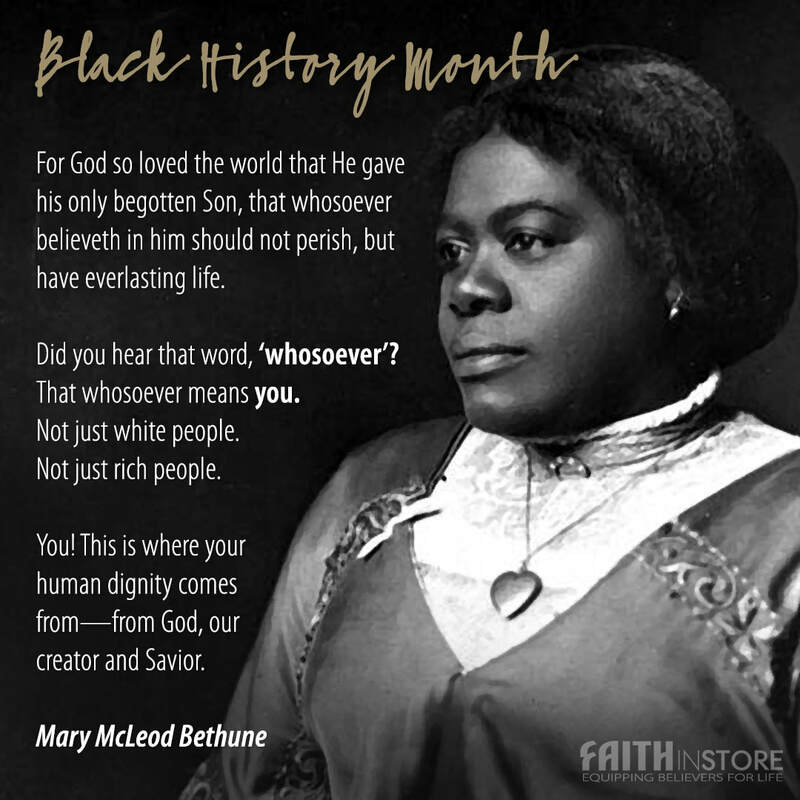 In our desire for justice, God, help us have the will to move forward with the spirit of Mary McLeod Bethune. As we look toward a brighter future, may we consider how we might improve the lives of those around us by meeting their greatest needs. God does not view people the same way our culture views people. People who change the world do not have to come from wealthy or powerful families. God does not believe in or operate caste systems. He shows no preferential treatment toward anyone. Sometimes, God uses fishermen to change the world—to turn history upside down. It should come as no surprise to us when God uses people from humble beginnings to impact their towns, societies, cultures, and the world. 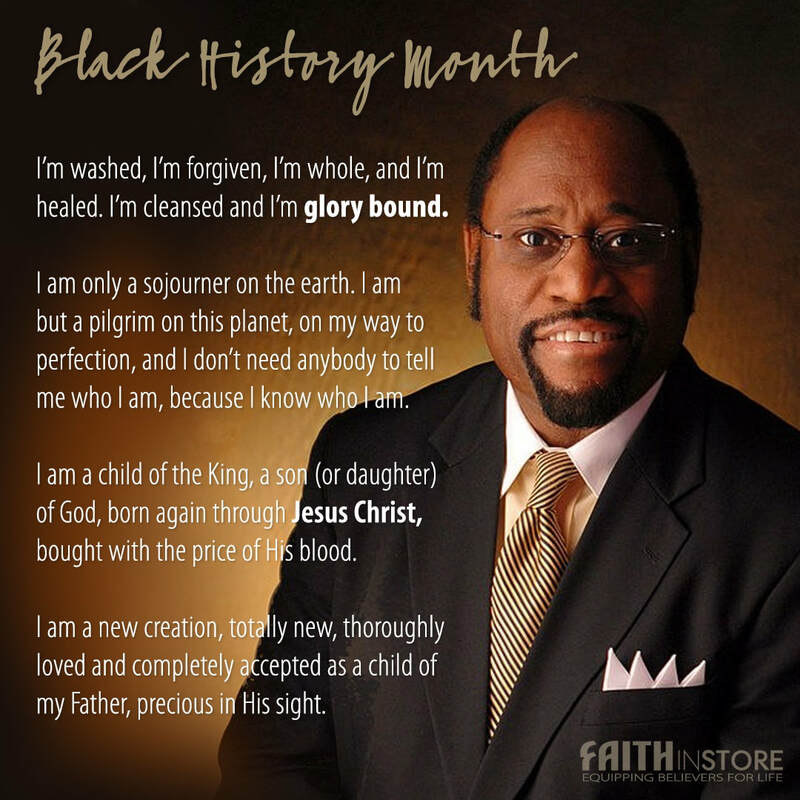 Dr. Myles Munroe is one such person. God looked past his circumstances and into his heart, and saw a leader. Dr. Munroe and his ten siblings were born to poor parents in the Bahamas. In the two-bedroom shack in which he was raised, many of the children slept on the floor among rats and cockroaches. His mother gave him his first advice about leadership when he was five years old: “The more you watch TV, you will never get on TV.” From that point forward, he tried to spend his free time reading books instead of watching television. Without any plans to become a minister, Dr. Munroe led a Bible study while working for the government of the Bahamas. He became very passionate about the Bible study and this was one of the things that led him into ministry. God’s plan required him to leave his government job. Dr. Munroe’s big break occurred when he attended a conference in Tulsa, Oklahoma. One night during the conference, the hand of God was moving and the scheduled speaker was unable to attend. Dr. Munroe was chosen to speak instead—on the same night that there was television and radio coverage of the event. This opportunity converged with his preparation and a God-ordained moment was seized. Dr. Munroe went on to become an international motivational speaker, best-selling author, educator, leadership mentor, and consultant for government and business. He traveled throughout the world to talk about the maximization of individual potential, including the transformation of followers into leaders. He became the founder and executive producer of a number of radio and television programs that aired worldwide, and also wrote various Bible editions, journals, and magazines. When we think on the life of Dr. Munroe, let us celebrate a man who did not see his circumstances as a limitation. Instead, he left his humble home to form an international ministry. This month, join me in reading Dr. Munroe’s book, Becoming a Leader, by clicking here. For a full list of the resources we offer from Dr. Munroe and Bahamas Faith Ministries International, click here. This is a story about the paths that God sets before our feet. As we trace the travels of our lives, we often see the fingerprints of God on the journey we’ve taken. Thomas Andrew Dorsey was born in the rural community of Villa Rica, Georgia, in 1899. His father was a minister of the gospel and his mother was a music teacher—two paths that would intersect for Thomas later in life. The family was not wealthy. In fact, at age eleven, Thomas began selling concessions at an Atlanta theater to help his family make ends meet. Working at the theater allowed him to learn to play the piano, as his love for the medium of music continued to grow. The story of Thomas is the story of all of us. We all come to the point in our lives where we decide whether to follow the compass or venture into the wilds and chase destruction. As he pursued music, the lifestyle of blues and jazz led him away from the Lord. At age seventeen, he set out on his own, traveling and playing piano at any blues and jazz gig he could find. He wrote music with suggestive lyrics and seemed destined for success as popular blues singers began recording his works. He put together the Wildcats Jazz Band, which backed the popular blues singer Ma Rainey. He was now known as “Georgia Tom,” a new identity for a man who had wandered away from his Creator. At his sister-in-law’s invitation, Thomas returned to church. As he reconnected with God, the unsteadiness ceased: Thomas was healed. Because of this, he committed himself to the Lord. Thomas began writing songs for church, blending different styles and genres. While some didn’t accept his music initially, others connected to the sounds of the gospel for the first time. Thomas became known as the father of gospel music. In 1932, he became the choir director at Chicago’s Pilgrim Baptist Church, where he would serve for forty years. This allowed him to work and focus on creating music. 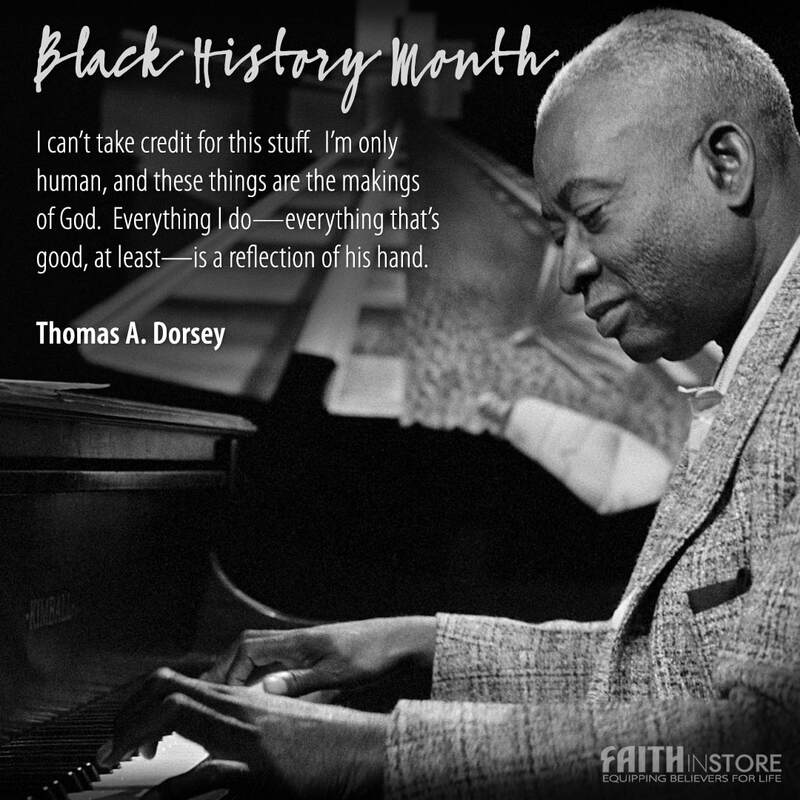 He also started Dorsey’s House—the first black publishing house for gospel music. Thomas wrote hundreds of gospel songs that were recorded by such singers as Mahalia Jackson, Aretha Franklin, and Elvis Presley. Thomas set the stage for contemporary Christian music, allowing musicians to use varying styles to spread the message of Jesus Christ. When he embraced the call of God on his life, the Creator of the universe used him to reach into the hearts of all who would listen through the vein of music. To listen to Thomas A. Dorsey perform, "Take My Hand, Precious Lord," click here. Many times throughout history, we have seen God welcome people with volatile pasts into his Kingdom. We serve a God who never sees us as too far gone. Lecrae, a Christian rapper and author, has a heartbreaking, inspiring, and God-honoring testimony—a gripping reminder that God can use ALL of us to impact this world and bring people into a relationship with Him. As he was growing up, Lecrae struggled with a feeling of emptiness. He longed to feel that he was significant, but the world around him was sending different messages about his worth. He was raised by a single mom and never met his father, which caused him pain that he felt for most of his life. The search for significance and a father figure led him to the world of hip-hop; the songs and videos he saw connected him to a life of gangs, crime, and drugs, while Lecrae still hoped for a light to shine on the darkness in his life. In his testimony, Lecrae discusses a moment when he walked out in front of a car and pointed a BB gun. The woman in the car started to cry, thinking this was the end of her life. Lecrae was heading in a direction that he had seen many go before him. His worried mother told him that he needed to read the Bible, but Lecrae started to tear pages out of it, not wanting anything to do with God’s Word. As Lecrae reflects now, he remembers a time where he was arrested and considered himself a “misfit of a person.” The more he ran from God, the more profound his emptiness became. After being invited to a Christian conference, he saw that there were people just like him who were now pursuing Jesus Christ. While this impacted him, it did not cause him to immediately cling to Christ. Later, while driving on the highway, he lost control of his vehicle. His car flipped multiple times and was destroyed. The impact was so severe that his glasses were embedded in the dashboard—yet he emerged without a scratch. In that moment, he gave his heart to God. Lecrae began working with troubled youth at a juvenile facility and he would perform rap songs he had been writing. He noticed that the teenagers connected—to the point of tears—to the hopeful messages he was rapping about. As they began requesting that he perform the songs over and over, Lecrae knew what God wanted him to do. Unlike many rappers, Lecrae is spreading a message of the love of Jesus Christ, focusing on bringing hope to the hurting. While it has been a long and sometimes painful journey, he “has learned to stay close to my source of significance.” Light now exists, where darkness used to reign. 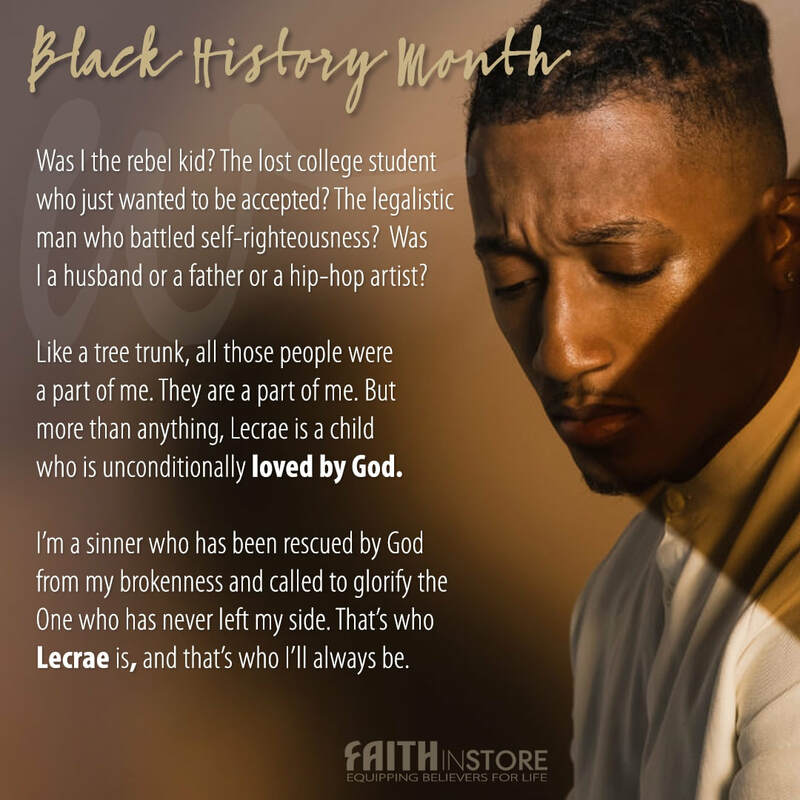 If you would like to read Lecrae's story in greater detail (His book "Unashamed") or connect with his music or any of the resources we offer, click here. Harriet Tubman is a name that most of us learned in elementary school. For some of us, hearing her story was our first exposure to the evils of slavery. She escaped the cruel institution in 1849. Reaching the north, she “felt like I was in heaven.” While many would be satisfied with their own freedom, Harriet was not. She made nineteen return trips to the South, leading over 300 oppressed people to freedom. Harriet Tubman is a beautiful example of someone who rejected the earthly kingdom with its man-made laws that assigned value based on race, and served a different King. May we be people who serve a different King, who are not content to live with injustice, but claim, in the name of Jesus, that our allegiances are bound to heaven. May we all live in this new Kingdom under the reality that ALL people are created in the image of God. 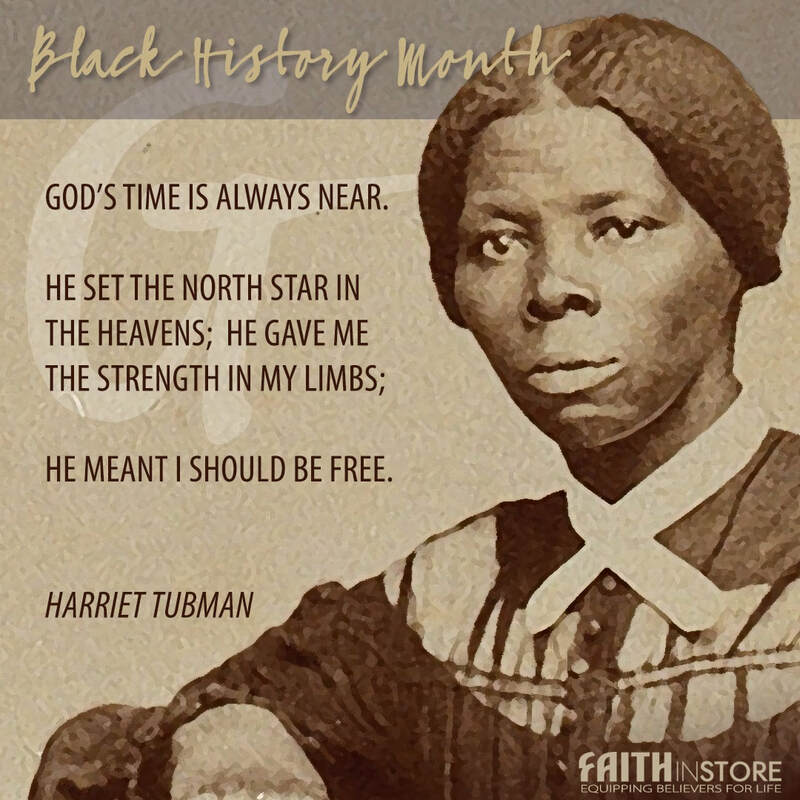 May we thank God that He gave us Harriet Tubman, who through her life showed us what a citizen of the heavenly kingdom looks like. Faith in Store has been around for a while, but we wanted to take a moment to reintroduce ourselves to our loyal customers and say a quick “hello” to the new friends we look forward to meeting this year. We believe that great things will happen in 2018. Our goal is to not only be a place where you shop, but also be an interactive community. We want to talk with you, pray with you, and journey together as we follow Christ. Feel free to start a conversation with us on any of our social media platforms: Facebook, Twitter, Instagram, Pinterest, or by simply calling us at 1-877-333-4411. In order to say both “hello” and “thank you,” we are kicking off with Free Freight February. All month long—no matter the size of the order—you will receive FREE standard shipping on domestic orders. Here’s to 2018. Something Good Is Coming Your Way. We are the official blog of Faith in Store! Now that we've been properly introduced, feel free to reach out using the "Get In Touch" link. As we journey along, we'll have multiple voices discussing various topics!